man freezes into the role of laborer. wax hardened into a tool one can write with. after washing away the leisure of yesterday. over; it is the cold force that arrests you. masking the turning of the present. leave only a partial trace of yourself here. take all the living detail with you elsewhere. Where are you standing when you disappear? Do you wear or are you worn by your labor? 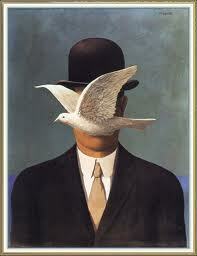 This entry was posted in Poetry & Snippets and tagged labor, leisure, poetry, René Magritte. Bookmark the permalink.